The most comprehensive retirement resource for older adults, their families & the professionals that serve them. Retirement Connection Guide is the most comprehensive local resource for those 50 & better, with hundreds of topics, comparison grids, educational articles and caregiver checklists. 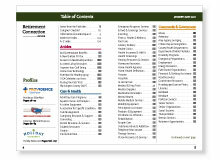 RetirementConnection.com contains 100+ topics of searchable listings of information organized by category, a news and events section, a link to a printable guide and marketing resources for professionals. We work within the community to build a business-to-business network. This includes a monthly e-newsletter, calendar, networking meetings, quarterly events, and professional development. An added feature of the guide are the housing and homecare comparison grids which compare specific details about each company’s services, amenities and pricing. This valuable tool is used not only by seniors and their families to “comparison shop”, but also by case managers and other professionals. An important element for the shelf life of any publication is to make sure the reader finds all they need in one resource. 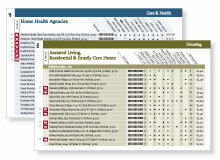 The more than 100 topics of information are separated into clear, easy to find, and color coded sections.